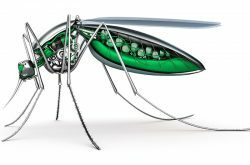 Insect Science® ready to use C.R.S. ToolKit® has been developed to monitor California Red Scale (Aonidiella aurantii) in citrus, olives and roses. These C.R.S. pre-packaged monitoring Toolkits are ready for installation. The Toolkit® contains twentyWhite Scale Cards, five C.R.S. pheromones and five wires. C.R.S. 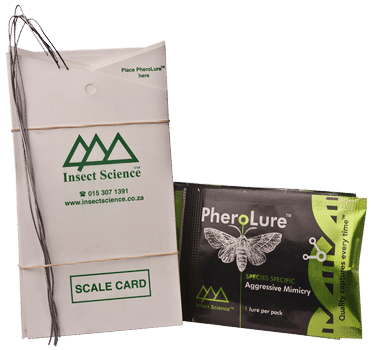 PheroLure® is used together with the Insect Science® White Scale Card. To assemble open the White Scale Card and fold the sticky side to the outside. Slide the galvanized wire supplied through the hole on the top of the White Scale Card. Open the C.R.S. PheroLure® and attach it to the White Scale Card as instructed under Assembly One White Scale Card with C.R.S. PheroLure® should be placed at a density of one per 2 Ha. Replace the White Scale Card weekly and the C.R.S. PheroLure® every 5 weeks. – Suspend the White Scale Card with C.R.S. PheroLure® on the western side of the top third of the tree, 300mm inside the tree line, for optimal effect. – The White Scale Card with C.R.S. PheroLure® should be placed in the middle of the 2 Ha area. – Place White Scale Card with C.R.S. PheroLure® at the start of crop production or pest cycle; this enables the population dynamic and trend over time to be determined. – Once the White Scale Card is removed, count the number of Red Scale males on the scientifically proven 24 UC grid design and multiply by 5 to attain an accurate figure. – Record the date and number of Red Scale males caught. 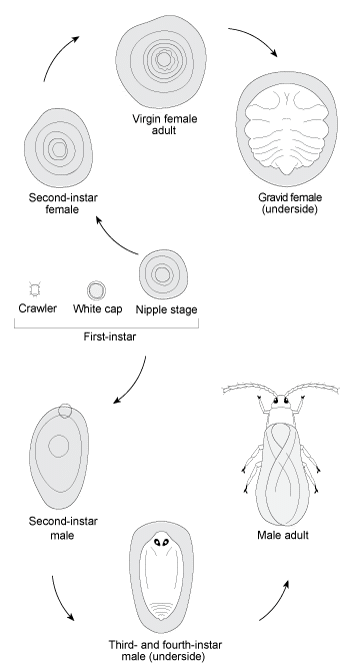 – Use Insect Science® Red Scale Infestation Chart for interpretation of weekly trap catches.